Like most 90s kids there are several reunions I’d love to see S Club 7, Ash Ketchum and Pikachu and Vanilla flavouring with Coca Cola (remember that?) but unlike most Arsenal fans one reunion I’m not in favour of, is the return of our all time goalscorer and legend, Thierry Henry. Arsene Wenger for all his success and attributes, has to be the most frustrating manager, no correction, the most frustrating man on the planet. The Frenchman continually refuses to buy, much to the annoyance of everyone associated with the Gunners and instead scans the globe for a cheap short term alternative which usually results in such signings as Sebastian Squilacci. Le Professeur should be looking not to cover Gervinho and Chamakh while at the African Cup of Nation but to be replacing the Moroccan and offering the Ivorian some strong competition for his place. The era of Henry & Co. was a great time to be a Gooner and probably something that will never be eclipsed by Arsenal or any other team. The current Arsenal team is different in every way from the time of Pires, Bergkamp and Henry and for that reason it is time for the likes of Song, Vermalean and RVP to make this Arsenal team their own and successful in their own way. Bringing back Henry would undermine the current Arsenal squad, especially with the incessant media coverage that will continually highlight what Henry achieved in his time in North London compared to the success or rather, lack of, since he has left. For once I’d love Arsenal to be linked with the players that the likes of Manchester City and Barcelona are chasing, I know we couldn’t compete financially but wouldn’t it be nice for Neymar to spotted at the Emirates having talks with the Gunners hierachy? 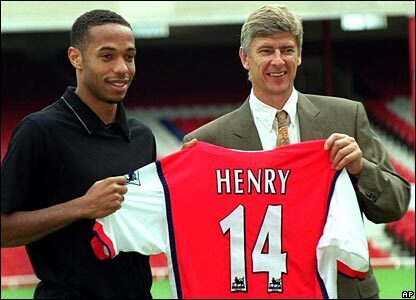 Rather than talking loan deals for a player that left Arsenal for bigger and better things (a lot of people forget this, I mean if you loved us so much Thierry, why leave?). You also have to look at Henry as a player, at 34 years of age will he still be able to run from box to box leaving an entire Spurs team for dead? Because that’s what we would all expect from the former Juventus winger, we all vividly remember the Henry that lobbed Barthez with his back to goal, could he still give us that va-va voom? It is true you don’t lose your natural talent but the former Barcelona player will have definitely lost a yard or two and despite having scored 15 goals in 29 games for the New York Red Bulls, which is an impressive record that Arsenal could do with ; you have to remember that Juan Pablo Angel was deemed prolific out in the States.